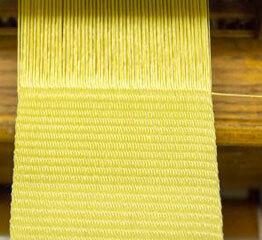 Aramid fibers include Kevlar® and are used in many safety applications: protective clothing, ropes, and webbing. Aramid is a manufactured fiber in which the fiber-forming material is a long chain synthetic polyamide having at least 85% of its amide linkages (-NH-CO-) attached directly to two aromatic rings. Aramid fibers have low flammability, high strength and high modulus. Most aramid yarns are affected by UV light which alters the natural color and degrades fiber strength upon prolonged exposure. Aramid fibers have found use in protective clothing, ropes and webbing used in safety applications and used as protection from ballistics and projectiles. Nomex® and Kevlar® are two popular aramid fibers produced by the DuPont® Company. Other aramid fibers include Tarwon®, Technora®, and Conex® brand fibers.